Q. What is the CranioCradle ®? A. 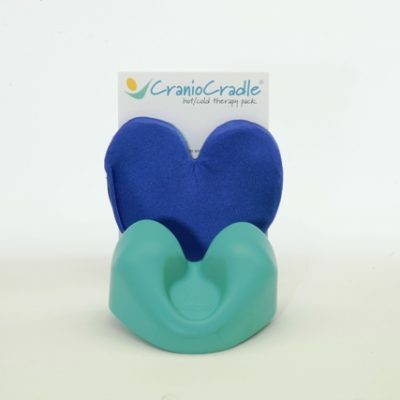 The CranioCradle is an easy to use therapeutic tool that gently relaxes tense tired muscles, relieves nagging aches, pains and fatigue so you can thoroughly relax. Q. How was the CranioCradle® developed? A. The CranioCradle was designed and developed by Barb Richmond, CEO of Kiss Life LLC, using the knowledge and experience she gained from over 20 years working in the health care field. Q. What is the science behind the CranioCradle? A. 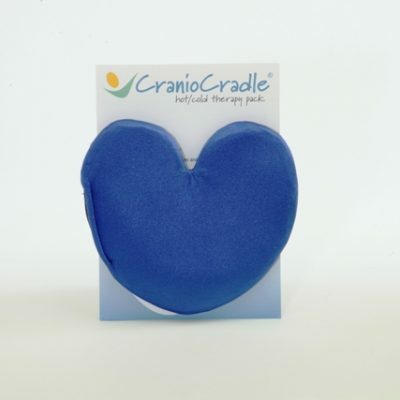 The CranioCradle is a home-therapy tool developed from a deep appreciation for the benefits of therapies that nurture the body’s ability to self-correct when given the right opportunity. They include osteopathy, massage therapy, craniosacral therapy, and a spectrum of other powerful light-touch modalities. Q. How was the CranioCradle tested? A. The CranioCradle was tested and fine-tuned by a collaborative team of highly experienced hands-on therapists. Q. What is the CranioCradle made of? A. It is a specific type of soft foam that is 100% recyclable and is made in the USA. Q. Are any elements of the CranioCradle and/or packaging recyclable? A. Yes! We believe in being green. The CranioCradle is made with a specific type of 100% recyclable foam material. The CranioCradle packaging is printed on 100% recycled paper. Q. What does the CranioCradle feel like? A. The CranioCradle is designed to feel and function like gentle therapy hands underneath the body. Its soft foam and specific design gives both comfort and relief. Q. Why is the CranioCradle effective? A. It’s design and applications are based on the hands-on modalities of osteopathy, massage and CranioSacral Therapy. It feels and functions like skilled therapeutic hands underneath the body, and the soft foam and specific design gives comfort and relief. Q. How does the CranioCradle help? A. The CranioCradle encourages joints to decompress and cramped tense muscles to gently release. With its craniosacral therapy applications, it creates a positive effect on the central nervous system while alleviating stress, tension and anxiety. A. The CranioCradle is designed to be placed under the back of the head, neck, body and low back to ease muscular stress, tension and pain. Simply place the CranioCradle underneath your body wherever you are experiencing pain. Specific step by step instructions for each application can be found in How-to-Use Videos and How-to-Use-Guide. Q. What type of pain, problems and symptoms can be relieved by using the CranioCradle? A. Each CranioCradle application has unique abilities to release pain and dysfunction in the body. In general, the CranioCradle helps relieve chronic neck and shoulder pain, low back pain, sciatica, stress, tension, anxiety, insomnia and relieves symptoms related to migraines, headaches, ADD, ADHD, Bruxism (teeth grinding), TMJ, whiplash. Q. What are the benefits of using two or more CranioCradles? A. There are many ways of using two or more CranioCradles underneath the body. For example, you can accomplish cranium to sacrum traction or you can create a thoracic or lumbar bridge to open and stretch the spine. Specific step-by-step instructions for each application can be found in How-to-Use Videos and How-to-Use-Guide. Q. Is it best to use the CranioCradle on a soft or firm surface? A. For most applications, it is best to begin using the CranioCradle on a soft surface such as a bed, sofa or massage table. For more pressure or for releasing Trigger Points (muscle hot spots), you might try a firmer surface, such as the floor. Q. Does everyone respond to the CranioCradle in the same way each time? A. Every time you use the CranioCradle your experience may be a little different. Select the application that best suits your needs and relax. The CranioCradle will work with your body to ease your stress, tension and pain. Q. How many minutes should I leave the CranioCradle in place? A. In general, muscular pain release, trigger point release or soft tissue release happens within two to five minutes; however, listen to your body and if you need more time that’s okay. Q. I’m a therapist. Are there ways for me to use the CranioCradle in the therapy session to help my clients? A. Yes. The CranioCradle can be used as an extra set of hands in your massage or light-touch therapy sessions to elevate, isolate and provide counter pressure. View how to use in a therapy session video. Q. How can the CranioCradle enhance my practice? A. The CranioCradle not only can enhance your practice by giving you an extra pair of hands during the treatments session , but it also allows your client to enjoy a deeper sense of relaxation and relief. It’s easy to use and easy to retail which provides you added income to your practice. See wholesale pricing. A. Yes! It’s easy to become a CranioCradle affiliate. Simply fill out this form and hit send. Once we receive the form we will notify you and get you enrolled. Q. Does it damage my CranioCradle when it compresses during use? A. 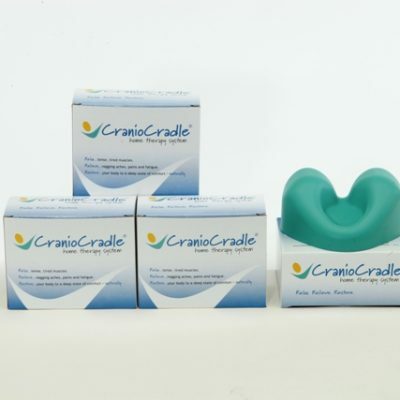 The CranioCradle is made of a specific type of foam that is designed to compress during use and then return to its regular shape within seconds after use. Q. How long will my CranioCradle last? A. Your CranioCradle should last for many, many years. Q. How do I clean my CranioCradle? A. Simply use warm water with liquid soap or any sanitizer commonly used in the home or healthcare setting. Q. Can I heat or freeze my CranioCradle? A. No, it can damage the material it is made of. Q. What if I want to return my CranioCradle? A. If you are not completely satisfied, we will cheerfully refund your money within 30 days of purchase. Q. Are there any restrictions for using the CranioCradle? A. Yes, there are situations where the CranioCradle should be used with caution or avoided altogether. Restrictions include, but are not limited to: cranium, face, or spine trauma, brain stem tumor, acute stroke, intracranial bleeding, inflammatory conditions, blood clots, cardiac conditions, pregnancy, carotid stenosis, thrombosis, venous obstructions and serious circulatory problems. If you’ve been diagnosed with or are concerned about any of these issues, consult your healthcare professional before using the CranioCradle. Q. Is there a way for me to use my CranioCradle for added hot or cold therapy benefits? Q. Do you have a Deep Tissue CranioCradle? A. Absolutely! 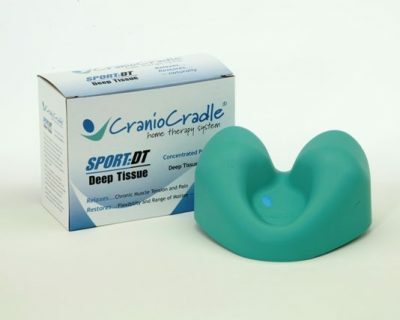 Try our NEW CranioCradle SPORT:DT. It provides concentrated pressure that is meant to be used by individuals with dense muscle mass, large-type body size, or those with a preference for deep tissue therapy. Q. Do you recommend any particular type of music while relaxing with the CranioCradle? A. We’ve comprised Music to Relax, Relieve, and Restore while using your CranioCradle. It has six selections that are each approximately ten minutes long. Three of the selections are piano compositions composed and performed by George Skaroulis. The other three compositions are exquisite flute melodies by Marina Raye. Q. Do you offer an eye pillow? A. We do! We offer both a lavender scented or unscented 100% cotton covered flaxseed filled eye pillow. Q. Do you offer any CranioCradle educational tools? A. Debbie Roberts, LMT, international author, teacher and founder of Debbie Robert’s seminars had developed CranioCradle educational videos teaching cervical solutions and migraine relief. If you are not completely satisfied with your CranioCradle, we will refund your money within 30 days of purchase. Security & Privacy: We do not store your Credit Card information. We promise never to sell, rent, share, or trade your contact information. Our disclaimer: The CranioCradle is neither a medical device nor intended as treatment for medical conditions. This product does not cure medical ailments or illnesses. No information provided by the CranioCradle manufacturer or its distributors, whether written or verbal, or provided in these instructions, in brochures, in websites or otherwise, is intended to be a substitute for professional medical advice, diagnosis or treatment. Consult a healthcare professional for advice regarding medical conditions. Please note when the CranioCradle should be used with caution or avoided altogether. Restrictions include, but are not limited to: cranial, face or spinal trauma, brain stem tumor, acute stroke, intracranial bleeding, inflammatory conditions, blood clots, cardiac conditions, pregnancy, carotid stenosis, thrombosis, venous obstructions and serious circulatory problems. If you’ve been diagnosed with or are concerned about any of these issues, consult your healthcare professional before using the CranioCradle. Kiss Life, LLC owns all rights to the CranioCradle product. It is trademarked and patent-pending.